Where ocean meets countryside!!! 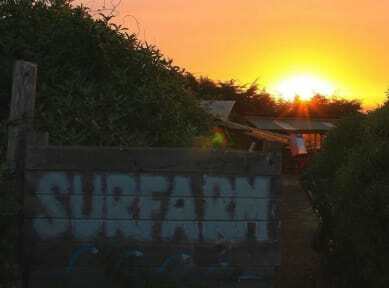 The Surfarm is based on the beach, in the middle of the countryside of the VI region, surrounded by green, cows, chickens and some of the country`s best waves to surf!! 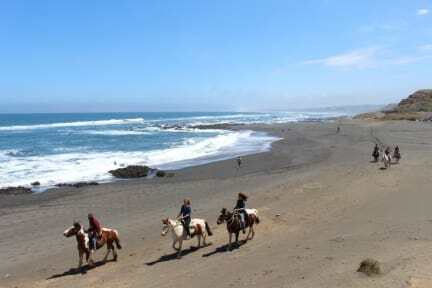 10min from world class surf spot Punta de Lobos, 15min from Chile`s surf capitol Pichilemu, we here at the Surfarm wanna share with you an untouched piece of Chile! Daily free transfers to the surfspots and the shops in town!! Small, ecological, chilled and always ready to start the BBQ we are the perfect place to wind down from busy city travels, loads of hours in our amazing waves or for anyone who enjoys mother nature gifts as much as we do! Ein sehr schöner Ort wenn man auch einmal Ruhe genießen will. Perfect to relax, surfing and enjoy the great community. The horseride on the beach was amazing. I really had an amazing time at this hostel! It was probably the one with the best atmosphere I’ve been to so far, incredible volunteers, incredible people, it really made me feel like home. and even though there is not really so much to do (if you don’t go surfing every day) the days pass by so fast that it’s not possible not to stay, at least, 3 nights at this place. I would recommend it to everyone who values a good community. Tolle Atmosphäre und Gäste. Ideal, wenn man etwas Ruhe haben möchte. Es gibt einen Transfer zum Surfspot Punta de Lobos. Zudem gibt es häufig die Möglichkeit nach Pichilemu zu kommen. Sonst ist die Strecke aber auch mit einem Collectivo oder Taxi bezahlbar. location great but a bit far away concerning shopping - so bring your stuff! great atmosphere, view, surf and staff!! Im großen und ganzen ausreichend für einen Surfurlaub. Jedoch ist die Lage etwas weit weg vom Schuss, was natürlich auch wieder seinen besonderen Flair hat. Es ist sehr ruhig und man ist direkt am Strand.Bei Bedarf wird man jedoch von der Stadt abgeholt, ansonsten wird es etwas kompliziert. Der Supermarkt ist ebenfalls nur in der Stadt und ohne Auto nicht zu erreichen. Ansonsten war das Personal sehr nett und es lässt sich dort gut aushalten! Trampen funktioniert dort zudem recht gut.